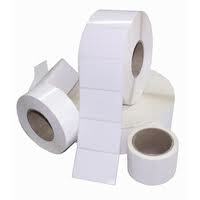 A UK Leading Suppliers of Thermal Direct Labels! One of the UK’s Leading Suppliers of Thermal Direct Labels! Thermal Direct labels are available in a range of standard and custom sizes and can be pre-printed with your information. Direct Thermal Uncoated – thermal paper labels for short term use, very limited resistance to marking or smudging and contact should be avoided with moisture, oil and fats. Ideal for short shelf life products, carrier/shipping labels. Direct Thermal Top Coated – Top coated direct thermal paper labels have a coating which prevents the thermally-printed image from being contaminated by condensation, fats, grease, solvents and plasticizers from packaging films that the labelled product may come into contact with during transportation and storage. Freezer adhesive is particularly suitable for cold-storage applications.